No festive birthday wish or party would be complete unless it included balloons. 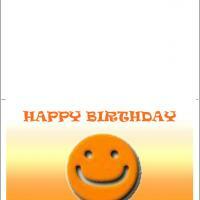 Here, is a card just covered on the front with large and small balloons. There are blues, greens, yellows, and pinks all the colors that appeal to all ages and genders. Thirteen balloons are strategically placed and include easy-to-read block letters that spell out a cheerful happy birthday. Our free printable birthday cards are easy to add your own custom printed birthday messages inside. 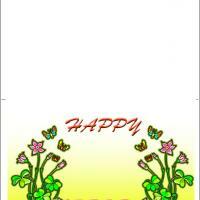 Some are blank so you or your kids can hand write your own greetings. Keep some extras printed for that unexpected birthday that you do not want to miss. 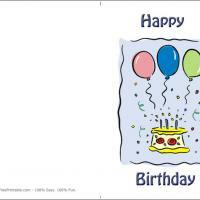 The colorful balloons on these free printable cards announce a very happy birthday to anyone you choose. Think of some happy message to write on the inside of this card and while you're at it add some more balloon designs too. These printable birthday cards are bright, cheerful, and full of life. This card is a perfect selection for any birthday party. Remember, you can custom it to include a message inside that is just as colorful as the outside for something truly memorable. Print off this card today and give someone a lift for the rest of the day. Hello! Just floating in on a sea of colorful balloons to say happy birthday to you. That is just one example of a customized personal greeting you can include before printing our Balloons free printable birthday cards. You will be amazed how easy it is to set-up and print. 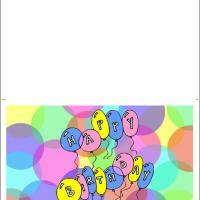 This card features a large front cover loaded with colorful balloons. The gender-neutral colors of greens, blues, greens, and yellows will appeal to all ages. The center balloons are all lined up just right to spell out a wispy happy birthday greeting. 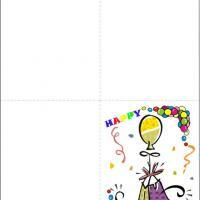 Balloons printable card could easily be used as a birthday party invitation too.